Further details have been released about Seven Seas Explorer, the latest vessel from Regent Seven Seas Cruises due to come into service in summer 2016. The ship will offer a meticulous level of craftsmanship together with lavish detailing. The main atrium lobby will feature a circular inlaid marble floor and will act as the heart of the ship. Twin etched glass staircases will draw the eye upwards towards a crystal chandelier. The vessel will see a new category of suite introduced named the Regent Suite. This two-bedroom suite comes complete with an in-room spa retreat – a first at sea with a personal sauna, steam room and treatment area. The suite also features an outdoor, glass-enclosed sitting area known as the Vista Garden. Here guests can enjoy unobstructed 270-degree views over the ship’s bow and toward the horizon. Several dining venues are planned for the vessel. Regent Seven Seas Cruises’ signature steakhouse Prime 7 will be added and will host a new décor of dark purple hues silver accents and plush leather seating, reminiscent of a London private member club. Compass Rose, the main dining room, will receive a new contemporary and sophisticated look complimented with a cascading aqua-blue chandelier. Chic Italian Riviera-inspired La Veranda on deck 11 will offer casual indoor and al-fresco dining whilst La Veranda, the buffet restaurant on-board, will offer 270-degree ocean views. This venue will transform in the evening into Sette Mari at La Veranda, an elegant fine dining restaurant for dinner. The two-tiered Constellation Theatre with a 694-seat capacity will offer a variety of cabaret-style seating together with cocktail tables. The Observation Lounge will be inspired by the opulence and indulgences of the Roaring Twenties and will feature a colour palette of rich silver, gold, black and white hues. The lounge will benefit from floor-to-ceiling windows and will feature a crystal chandelier above the dance floor. Explorer Lounge will offer more of a country club vibe with rich mahogany wood columns, comfortable leather chairs, deep blue fabrics and sumptuous flooring. The 56,000 gross ton Seven Seas Explorer will have a capacity of just 750 guests and will set sail on its inaugural voyage on 20 July 2016 from Monte Carlo. 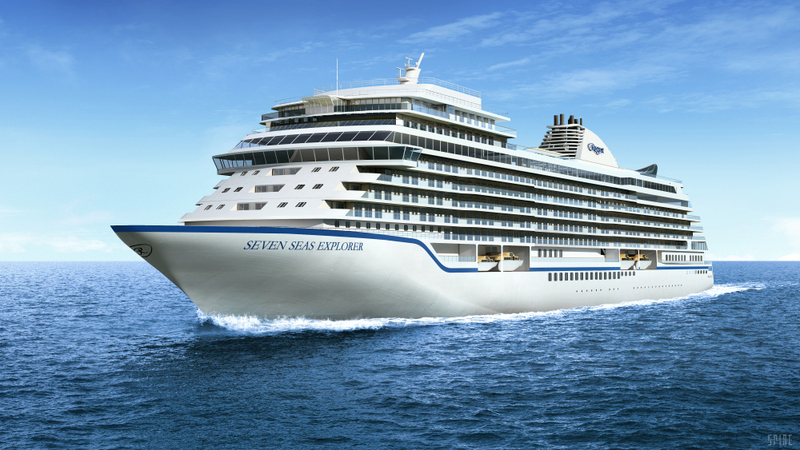 Reservations for Seven Seas Explorer’s maiden voyage and inaugural season open 19 January 2015 exclusively for Seven Seas Society members and will become widely available starting 4 February. Back in December 2014 renderings of the new ship together with a teaser video were released.